Nowadays, things move faster than ever. And it often feels as if you have something to do all the time. This is a common trap that can cause “burn-out” at work and stress in your personal life. To avoid this from happening, successful people have developed a habit of doing a Weekly Review. The idea is simple: you take 2 hours each week to look over what you did the previous week, and then make a plan for the upcoming week. 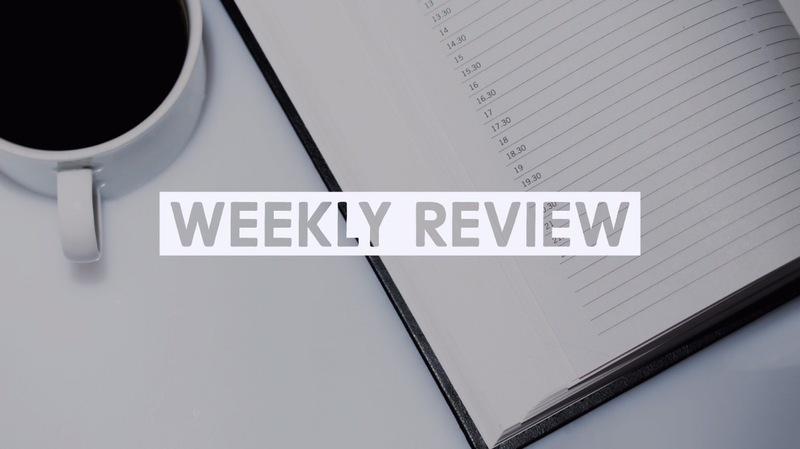 In this article, I’ll guide you step by step on how to do your weekly review. First lets have a quick look at our current relationship with time. In our days, it easy to catch yourself feeling as if you are always doing something, but not getting much done. Historians have debated this phenomenon for decades. Some of them think that this is the main reason why modern men feel so unhappy. As far as we know, ancient people didn’t feel depressed. Partially because “Monday” didn’t have the same meaning for them as it does for us. Ancient civilizations realized that time moves only forward (ie “linear time”). So they created weekends (and New Years) as a time for rest, reflection and new beginnings. This is how “linear time” became “circular time”. What’s passed is passed, and next week we start again. However, in our time, we have a lot of technology around us. And this makes it hard to feel the weekends anymore. People almost never find enough time to look back. And looking only forward is extremely tiring. A Weekly Review is your time to bring control and satisfaction to your days. You schedule a couple of hours, on a fixed day in your week, and use this time to review your previous week and plan your upcoming week. It’s a way of looking back at what you have achieved over the past week and a way to plan how you should act in the coming week. In Getting Things Done, productivity consultant David Allen reminds his readers how important is to “refresh and reset with a Weekly Review”. He warns that it’s hard to keep up with the world otherwise. Weekly reviews, he says, is what keeps him in balance. Because there’s simply no way to regroup while trying to get everyday work done. You must get your strength back at the end of the week. Just stopping for a moment to think over what you have done may be enough. When to do a Weekly Review? Weekly reviews can be done on any day of the week. I like to do my review on Sunday mornings. That’s the time when my kids are usually sleeping late. So I wake up early – do a cardio workout and meditation / prayer. Then make my way to a local coffee shop and spend a couple of hours with my paper journal / planner doing a weekly review. I know some successful entrepreneurs who do their reviews early Monday morning or Friday afternoons. So it’s something you can experiment with to fit your schedule. How much time is needed for a Weekly Review? It generally takes between 2 to 3 hours to do a weekly review. Yes, this might sound too time consuming. However, the time you invest in your Weekly Review will generally save you many hours of wasted time during the week. So a Weekly Review is a worthwhile investment. How to do a Weekly Review? At the end of any given week, your brain is rather similar to a bag. You won’t be able to pack any more clothes in it if it’s stuffed. You need to empty it beforehand. Collect each piece of paper or loose post-it note lying around. Try to remember everything you might have forgotten to put on paper. Implement Zero Inbox policy. Meaning no unread messages in your Inbox at the end of each week. (It may seem scary now, but, god, you’ll feel so good about yourself afterwards). Make a list of what you successfully accomplished during the past week. Empty your head and feel good about yourself for a moment. You did that. And it’s time to take a little breath. Let’s face it, next week will be no different than the last. But, now that you know what you did right and what went wrong during the past seven days, you’re far better prepared to embrace its challenges. And this is the second phase of your weekly review: getting current. It’s the phase concerning your next week. Getting current is all about assessing and evaluating. So, review and categorize. By now, all past week’s tasks should be either “done” or “to do”. Go over your lists. Each of them is important: “Next Actions”, “Waiting For”, “Projects”. Make a list of all the people you need to call or send an email to during the next few days. Make a list of what you intend to accomplish during the next week. Sigh. You’re all but done. Because this is the best part. You’ll notice that you’ll feel more creative even while getting clear and getting current. New ideas will come to you on the go. You’ll think of ways to be more efficient in the future. You’ll certainly have few “That reminds me” moments. You might even have an “Aha” moment. But, you’ll certainly start enjoying yourself. Words of caution: The feeling of clarity might happen only after several sessions of Weekly Reviews. Remember that your body needs to build a habit of doing a weekly review. Without the habit, it will feel strange. And you might actually feel overwhelmed the first couple of times that you do your weekly review. Don’t be alarmed. These feelings are normal. Keep going. It will become better over time. And soon you’ll begin to feel the magic of your weekly review. Reflecting on your past and getting clear on your future is a key to staying focused & getting stuff done. There is something very rewarding in the feeling that you have achieved something. And getting things done begins with your Weekly Review.